A BBC 5 Live presenter has revealed he is battling leukaemia after ignoring a host of warning signs. Chris Latchem suddenly began to lose weight last year, which he put down to him drinking less to be fresh for his sports presenting slot on the breakfast show. 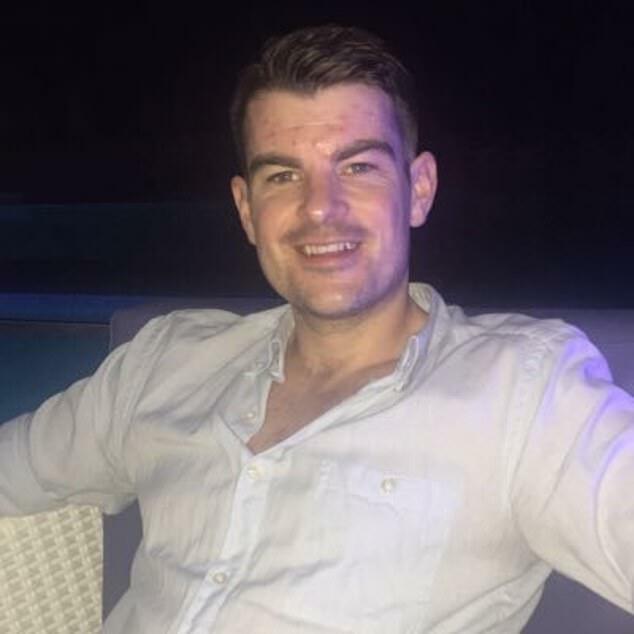 But when Mr Latchem – who is in his ‘young thirties’ – took a turn for the worse last October, a GP was forced to come to his home and deliver the devastating diagnosis. Assuming he would be ‘gone by Christmas’, Mr Latchem claims treatment has made him feel better than he has in years, and optimistic he will live a ‘long and relatively healthy life’. 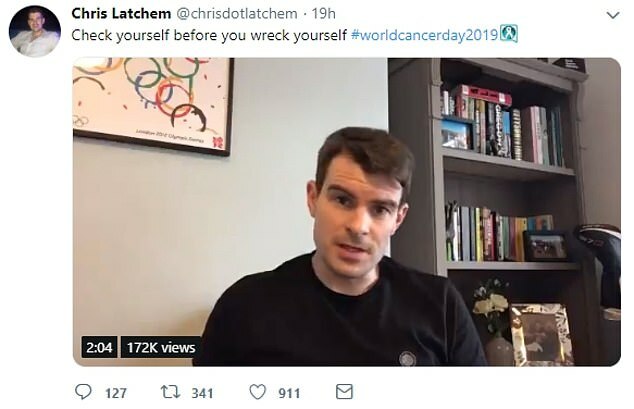 Speaking to his Twitter followers yesterday on World Cancer Day, he urged people to ‘check yourself before you wreck yourself’ in a post that has been watched 172,000 times. Although Mr Latchem had been feeling under the weather for a while, he had ‘a few things going on’ last year and blames being a man for him ‘sweeping everything under the carpet’. He dismissed his tiredness as being due to his early shifts on the radio and put his night sweats down to the stress of buying a house. After finally seeing his GP, the doctor warned there was ‘no way to sugarcoat it’ and diagnosed the presenter with cancer. Although he assumed he had been dealt a ‘death sentence’, Mr Latchem said he is, in fact, ‘fortunate’ that his leukaemia is treatable. His doctor – based in Stockport, Greater Manchester – even compared the disease to diabetes, in the sense it could be a lifelong condition but Mr Latchem can still be relatively healthy with it. Although reluctant to be an ‘influencer’, he urged his followers – particularly ‘blokes in his age bracket’ – to see a doctor if they notice any unusual symptoms. There are different types of leukaemia, which depend on the specific immune cells affected. It is unclear what form of the disease Mr Latchem is suffering from. For all types combined, 9,900 people in the UK were diagnosed with the cancer in 2015, Cancer Research UK statistics reveal. And in the US, around 60,300 people were told they had leukaemia last year, according to the National Cancer Institute. Symptoms typically include pale skin, fatigue, breathlessness, frequent infections and bleeding, such as from the gums or nose. Leukaemia is a cancer that starts in blood-forming tissue, usually the bone marrow. It leads to the over-production of abnormal white blood cells, which fight off infections. But a higher number of white blood cells means there is ‘less room’ for other cells, including red blood cells – which transport oxygen around the body – and platelets – which cause blood to clot when the skin is cut. There are many different types of leukaemia, which are defined according to the immune cells they affect and how the disease progresses. For all types combined, 9,900 people in the UK were diagnosed with leukaemia in 2015, Cancer Research UK statistics reveal. And in the US, around 60,300 people were told they had the disease last year, according to the National Cancer Institute. Most cases have no obvious cause, with the cancer not being contagious or inherited. Leukaemia generally becomes more common with age – the exception being acute lymphoblastic leukemia, which peaks in children. Other risk factors include being male, exposed to certain chemicals or radiation, and some bone-marrow disorders. Symptoms are generally vague and get worse over time. Acute leukaemia – which progresses rapidly and aggressively – is often curable via chemo, radiotherapy or a stem cell transplant. Chronic forms of the disease – which typically progress slowly – tend to incurable, however, these patients can often live with the disease.